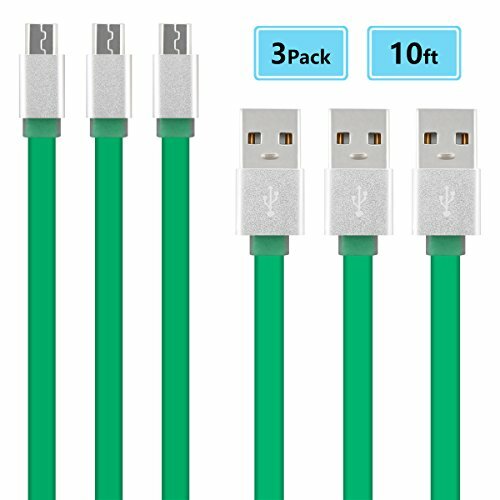 3Pack 10ft Micro USB 2.0 Cables. Industry leading high speed charging & data transfer. Charge around 7% faster than many standard cables, supports a high-speed USB 2.0 data transfer rate of up to 480Mbps. 4000+ bends tested, several times longer than standard cables, in case you charge your device twice a day, this cable can last for a long time. Samsung Galaxy S6, S6 Edge, S6 Edge+ Plus, Galaxy S5 , S4, S3, S2. Samsung Galaxy Note 5, Note 4, Note Edge, Note 3, Note 3 Neo. HTC One M9, M8, M7, E8, One, One Remix, HTC Desire Series. LG Flex 2, LG G4, G3, LG V10. Motorola Droid Turbo, Moto X, Moto G, Moto E. Nokia Lumia Series, Nokia X Series. Google Nexus 6, Nexus 5, Nexus 4. Extra long 10ft micro USB cable is convenient to use while in bed,a car, a hotel room and even the office. Flat 8-Pin Lightning USB Sync & Charge Cable Specifically Designed for Samsung, HTC, Motorola, Nexus, Nokia, LG, HP, Sony, Blackberry and more. What You Get:Mykcuu 3 Pack 3m Extra Long Nylon Braided Micro USB Cable , Every item you ordered from Mykcuu can enjoy a free replacement or full refund within 12 months. If you have any questions or problems, don't hesitate to contact us! and friendly customer service. If you have any questions about this product by MyckuuTM, contact us by completing and submitting the form below. If you are looking for a specif part number, please include it with your message.